3 this may have looked like a solitary adventure but I could not have made it all to way to Halifax without you. Let me expand on message 3. The last leg of my journey was in some ways the toughest. 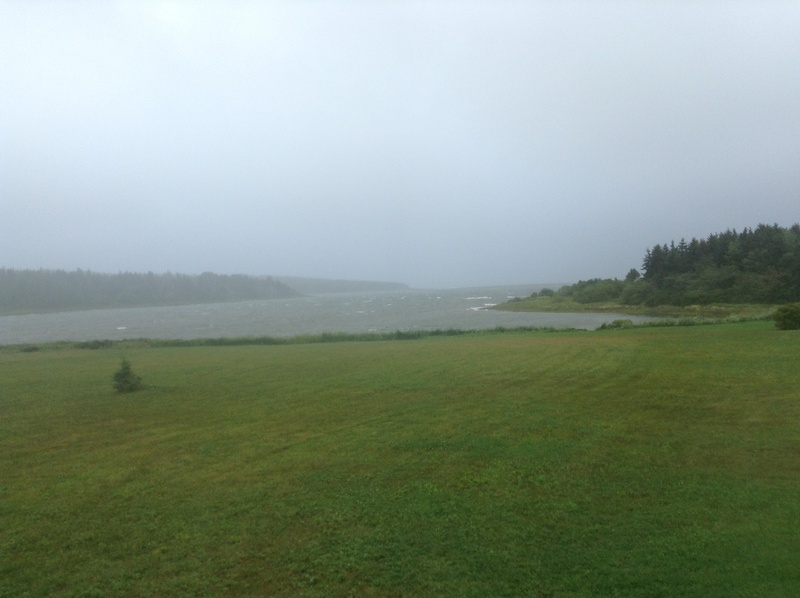 I was tired, I ached, I frequently went to bed at 8.30pm, avocado had lost its appeal, it rained more and the hills in Cape Breton were ridiculous. If I have cycled farther it is because I was supported by the legs of others. You got me on the road and you kept me going: thank you. Thank you to the people who hosted me, gave me food, and helped me launder my pongy socks. Thank you for the stories you shared, the eggs you fried, and the kindness you showed me. Thank you strangers for coming to help. Thank your for pulling over in your car on the hot days to ask if I had enough water. Thank you for the pizza, for the car keys, for turning up on the roadside with a track pump, for letting me sleep in the hut when I was too tired to pitch my tent. Thank you for the small gestures that made my day. Thank you to all who helped me with my preparation, planning and training. From getting my body (and lumbar spine) in shape to telling me that I could do it when it all felt like too much. Thank you for beautiful practice rides in the Cotswold hills, advice on kit, kit as Christmas presents, encouragement, support and generally getting me to the start. Thank you employers for giving me 3 months off work. Thank you fellow trans Canada cyclists for laughter and bemusement on route. Thank you for excellent blog writing, advice and campsite recommendations. For many an excellent moment of s’more toasting, hill climbing and eagle spotting. I will remember you fondly. Thank you bears for not eating me. Thank you Cycle with Dino cyclists for logging your trips. For encouraging my legs to keep spinning to follow your own honest miles. Thank you for dusting off your old bike, for cycling to work, from Le to Jog, in time trials, holiday spins, day rides, and early morning wildlife spotting rides. Each mile you pedalled inspired me to keep going. I imagined you pedalling with me and it really, really helped. 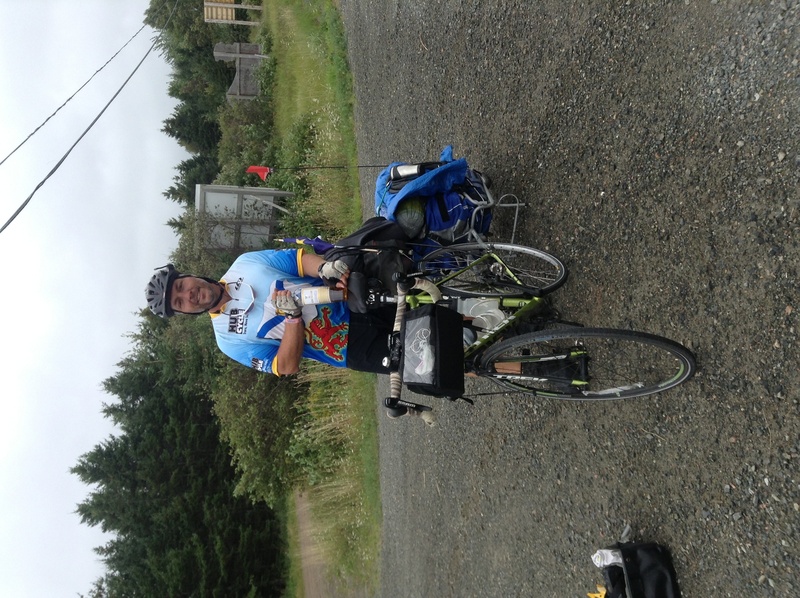 You cycled 11,724km – that’s all the way across Canada and halfway back. Thank you web master for creating the coolest blog map and for updating the dinomometer. Thank you Monty for being a true and trusty steed. Thank you for not developing any mechanic problems that I could not fix. Thank you for spinning in the sunshine and persevering in the rain. Thank you Canada for an amazing adventure. Together we cycled from sea to sea. Oh, and the moment you’ve all been waiting for! 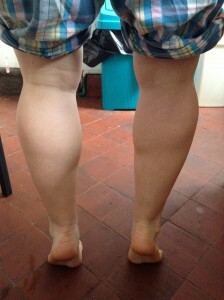 What do legs look like after they’ve cycled 7,500km? I awoke to fog. A few lamps cast fuzzy globes of warmer light on the grey, misty campground. The springy carpet of moss and thick grass was wet as I rolled up my tent for the last time this summer. Back at home, the Canadian geese are doing practice flights across the river. Soon enough I too will take the migratory flight home. I followed the coastal highway headed west. 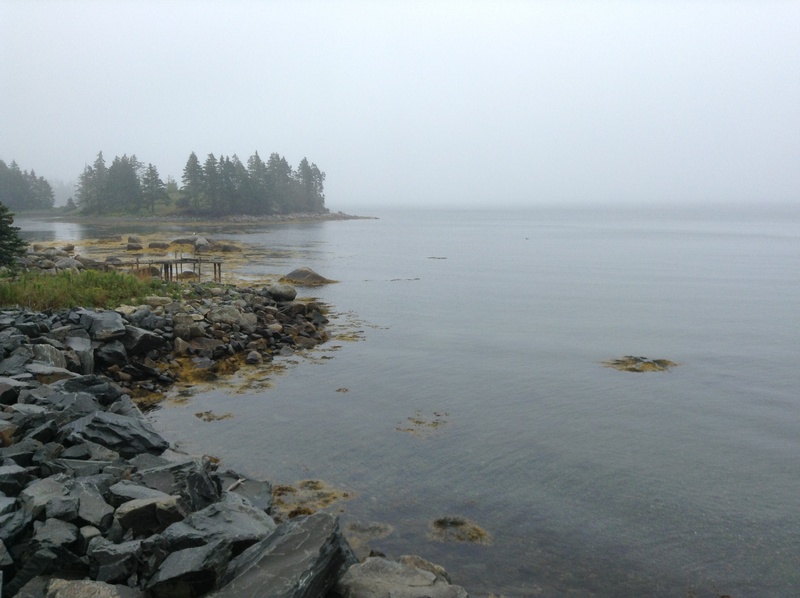 The fog hid the stitches between the ruffled ocean waters and the opaque sheet of sky. The air was cool, wet and quiet with the solemn stillness of an early Sunday morning. Gone are the holiday makers. Derelict boats, the paint peeling from their hulls, and houses for sale pointed towards a more affluent past when abundant hauls of lobster and cod were the order of the day. A sunning of cormorants stood on the harbour rocks waiting for the cloud to break its hold over the sky. Flashes of lemon-yellow tweeted in the trees, the goldfinches fluttered and called in turn as the cyclist pedalled by. 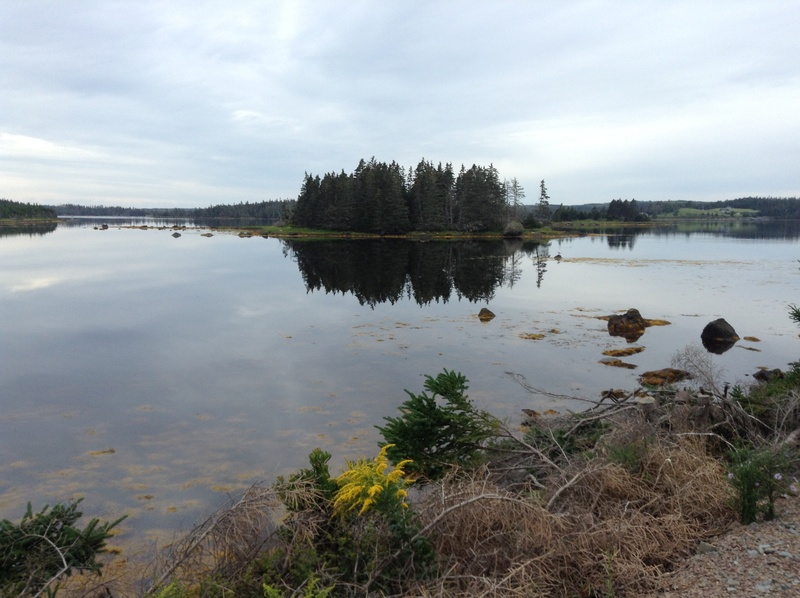 I stopped to enjoy the view of one of the harbours. Looking out into the water I was not aware that eyes were watching me until I turned to continue and saw, at the crest of the hill, the lithe figure of a deer. Our eyes met and the spirit turned, springing into the air with the grace of a ballerina. I watched its dancing retreat along the road until it disappeared back into the spruce forest. After a slow but steady morning on the road I cycled through a harbour town where I expected to find a dry picnic spot where I could ceremoniously eat The Last Avocado. These coastal towns usually only have one road – the highway – and so stretch out for a few kilometres without much of a central hub. I passed all the way through the town without finding a spot. Still hungry, I had to take my turning off onto the main highway towards Halifax. Within meters the heavens opened. First one heavy drop, seconds later a pounding rain battered the road like an army of drummers. The cold bullets of rain hurt as it hit my bare legs. There were no buildings in sight, no rocks to hide under, nor trees that could afford protection. The wind created ribs out of the waves sliding down the road. With nowhere to stop and a hollow stomach I kept on pushing up the hills. Then: a triple flash of lightning. The head-splitting crack of thunder. In that flash and roar echoed the terrifying memories of Calgary. Except for the dip of the hills, there were no structures pointing to the sky – no buildings, not even a telegraph pole – a lone, drenched figure on a metal bike cycled alone into the thickening storm. 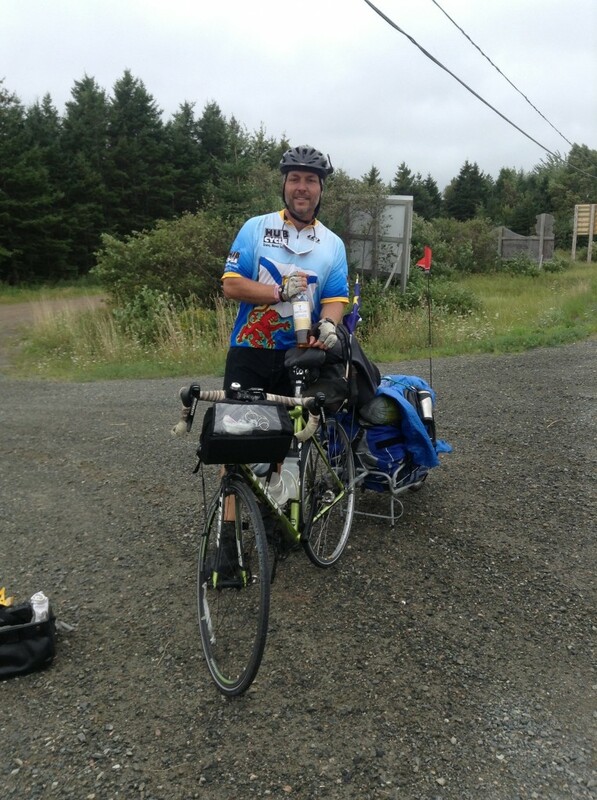 I imagined the sad tale of the person who cycled across Canada only to be struck by lightning 30km out of Halifax. It was in the local paper. I carried on pedalling. My muscles burnt with lactic acid as I ascended the steepening hills. 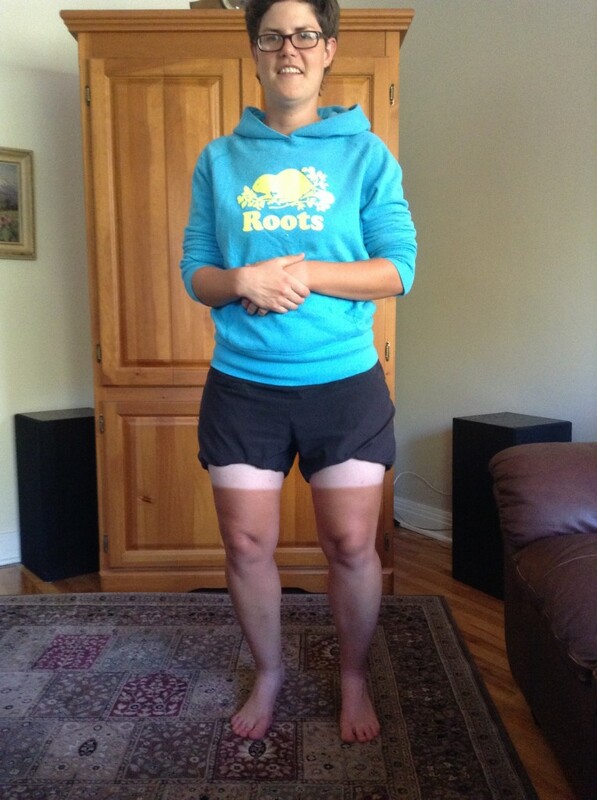 In defiance of the 12th day of non stop riding, hills and lactic acid, my Atlas legs burned along the highway. I have not cycled 7,500 kilometres across a continent to be beaten now. I came to a flyover bridge and hid underneath, waiting for the thunder to past. Please go, please go, I urged. Before I get too cold. I stuffed my last protein bar into my face, packed my jersey pockets with the last of my jelly beans and M&Ms. I heard the cracks of thunder reseeding into the east. The westerly wind blew against me as I mounted Monty for the final time. I am not going to stop. I did not stop until I reached the city limits. The gaudy lights of the gas stations and fast food outlets were a dazzle of harsh colour against the grey day. The traffic into town was busy and gave me little space as it splashed past me. Two Alsatians in the back of a pick up truck barked loudly as they shot past me. I ate a final handful of jelly beans and headed for the ferry. I arrived at the Dartmouth ferry terminal just as a boat was pulling in. We boarded the boat. The end, on the far side of the small harbour, was in sight. My cold fingers unwrapped the last bite of my Kendle Mint Cake. I have carried this with me since the very beginning and it has survived, as sweet and restoring as ever. The ferry pulled out its dock and putted over to Halifax. That was nice. I’m glad I had a nice day near the end. Today was a reminder of how wonderful cycle touring can be (when the weather is good). As it’s my penultimate day on the road, I followed the coast south west towards Halifax. The coast is beautiful. Not in a big, showy way like the mountains, but in a gentle way that reflects the coast’s glimmering, smooth waters. The road swung to and fro between the hills and the natural harbours of the coast. The land was thick with Christmas trees and ferns. The ocean bays were framed in bronze and rock. By mid-morning the clouds had lifted, revealing a ceiling of perfectly blue sky. It was now hot enough for me to peel off my layers and hunt for the sun cream. Cycling on days like today is refreshing and invigorating. Over breakfast I was getting annoyed by the man from the camper next door who talked at me for an hour, asking me endless questions. He did not get the hint from my monosyllabic answers that I didn’t want to chat. But soon enough my stuff was packed and Monty and I were on our way. However annoying a person is (and, trust me, I’ve met some annoying people en route!) you know you can always pedal off. The difficulties of bike touring arise when you can’t pedal off (injury, broken spokes, awful weather, flat tyres etc). Problems that arise get fixed and the pedalling continues. I’m sure there’s a life lesson in there. Certain moments today – the loon calling, an attack of bugs while I ate Second Breakfast – reminded me of other parts of Canada. It’s been a long journey and it’s hard to believe it will soon be over. There are some things that I am, quite frankly, a bit bored of. Crackers and Kraft dinner, for example. Packing up wet tents. And answering the repetitive questions about my trip. But there are things I love and appreciate even more deeply than before: sunshine, tailwinds, wildlife spotting, M&Ms, the crackle of a campfire, the silky darkness of the night sky. But the best is this: that feeling I get when cycling along with the summer sun warming the skin on my back and the wind pushing me gently along. I’ve experienced that moment countless times on this trip. I believe I will never get tired of it for that feeling is called Pure Joy. 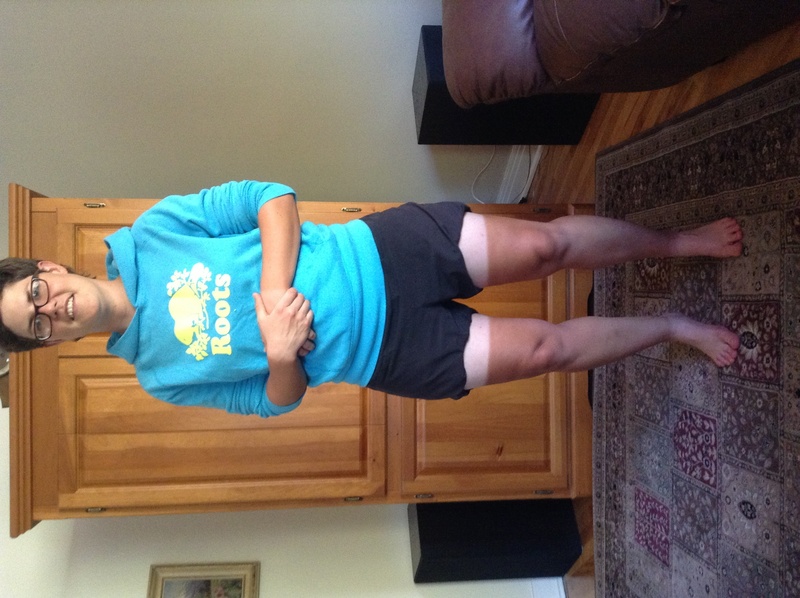 Canada, Cycling across Canada, Nova Scotia, sunshine, why am I doing this? So, that was awful. In fact, that was a strong contender for the hardest, cruellest day of the whole trip. You wonder why you get out of bed sometimes, don’t you? It rained all night. Loud, battering rain and gusting wind blew my tent around like a skiff in a storm. Despite having my earplugs in I was awaken throughout the night by the combination of frightful dreams and the weather pounding of my little green home. By breakfast time the tent was sodden and any shuffling inside caused water to seep in. Sipping my coffee in the tent porch, it did not appear to actually be raining but the air was so thick with moisture that it was hard to tell. I will miss Canada when this is all done with, but I won’t miss packing up a wet tent. I wound out of the campground under a gloomy sky. The wind shook the trees wildly. I stopped to take a photo of the drizzly ocean front but the water fogged up my lens immediately and the camera couldn’t focus. Only a few more pedal strokes down the road and a violent gust of wind blasted Monty a meter into the road. We would need to be careful. We joined the main highway. The wind, which was supposed to be pushing us south, appeared to have changed direction. A strong, cold crosswind slowed our progress to a miserable crawl. Trucks rumbled by with an engine roar and a spray of cold water. Turning off the highway onto quieter roads, my mood did not improve much. The wind now should have been at my back but it seemed to twist and turn in the air, punching violently in all directions. The rain, a slow, steady drizzle, continued relentlessly. The sky was a melancholy grey. I tried to remain upbeat by singing to myself. It did not work. I will miss Canada when this is all done with, but I won’t miss cycling in cold, wind and rain. Eventually I pulled into a community playground and hid under a small shelter. I remember my mother’s wise words: “Do whatever you need to do to not be miserable.” I called a B&B. They were full. I spied the colourful shapes of the playground, knowing that a climbing frame makes an excellent place to hang a tent. It was still raining but the rain is finer than it was when my tent got soaked. I contemplated whether my tent would get drier in thin rain given that it is currently sodden. I then contemplated what my life has become that I am sat in a deserted playground contemplating whether things can dry out in the rain. My stomach growled. So I ate the usual fare of avocado, crackers and apple. And then quickly polished off the rest of my M&Ms. I was now getting cold. I will miss Canada when this is all done with, but I won’t miss having to wolf down lunch before the hypothermia sets in. I looked up the distance to the campground. 37km. That’s not too far in sunshine. But it is a mission in the cold, wet and wind. Now there is just the road, the rain, me and my demons. The demons are yelling “give in!” But how? Where? I can’t give in you stupid demons because I’m alone in the middle of nowhere. I stick in my headphones to block out the irrational demons and pedal off. I pass a cheese factory, a Christmas tree farm, and a fish hatchery. The rest of the time I just pass mundane tree, ordinary house, and average side road. I approach a car that is pulled up, indicators flashing. At first it looks like the man is hustling a large tree into the side door. 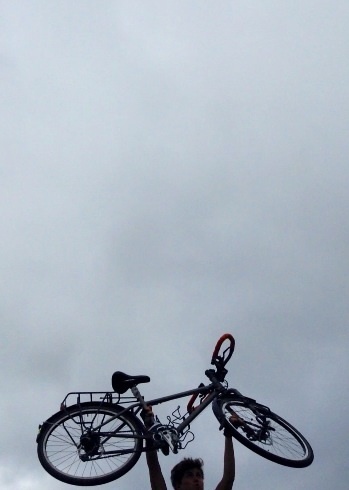 As I cycle past I notice a body: fresh, new trainers and a large denim-clad rear lying on the ground. I wonder if the body is alive for it looks to be in the recovery position. My instinct is to stop but then I remember I am alone. Why wouldn’t you flag down a car if your friend (?) was medically compromised and lying on the ground? Why would you put on your indicator lights if you were hiding a dead body? I reached the 7,500 kilometre mark on my bicycle odometer. I brake to stop for a celebratory snack, bash into a rock hidden in the earth and tumble from my bike in slow motion, bruising my bum as I fall. I pedal to the campsite. Thankfully it has stopped raining but the wind is kicking up a storm. I am greeted friendlily enough but then directed to what appears to be the windiest spot on the whole campsite. I tie a length of rope to a tree for a washing line and am struggling with my tent when an old gentleman walks over with a strawberry icecream cone and the air of someone with too much time on their hands. Oh no, not now. My tent is impersonating a wind sock, twisting and flapping as it is caught in the ferocious teeth of the wind. I will miss Canada when this is all done with, but I won’t miss “the conversation” (ie the exact same questions asked about my bike trip multiple times per day). I unzip my tent flap. Faith in life is restored. I drank half the delicious hot chocolate, adding in some Baileys that I had purchased on my return trip to town. 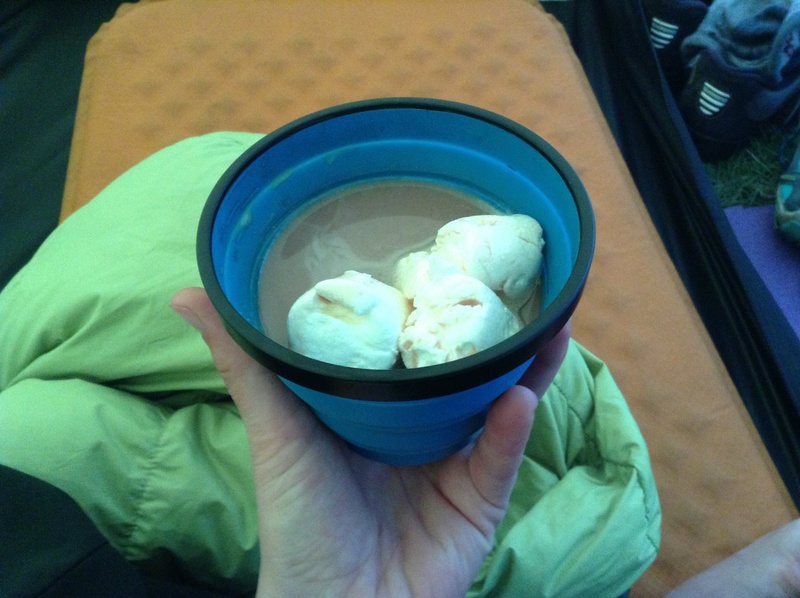 But then I go for another sip and the cup slips from my hand, throwing delicious Irish cream flavoured hot chocolate goodness over my shoes and camping mat. Today is the cruellest day.